Odisha CHSE Time Table 2019: Odisha 12th Class Time table for arts, science, commerce has been released.The Council of Higher Secondary Education, Odisha has released Annual Higher Secondary Examination date sheet 2018 on the official website of the board i.e.” chseodisha.nic.in”. The announcement regarding to CHSE Odisha 12th Class Exam Schedule was made from the Odisha Board. Odisha +2 examinations will be commerce from March 7 and it will conclude by March 30. This announcement gave a huge relief for lakhs of students across the state. Examinations will be held from 10:00 am to 1.00 pm. Council of Higher Secondary Education, Odisha was established in 1982, CHSE is a Board of Education seeking Senior Higher Secondary (Class 11 & Class 12 programs) for both public and private schools, Colleges under the Odisha State Government. It affiliates all the state and private schools and colleges in the Odisha state. 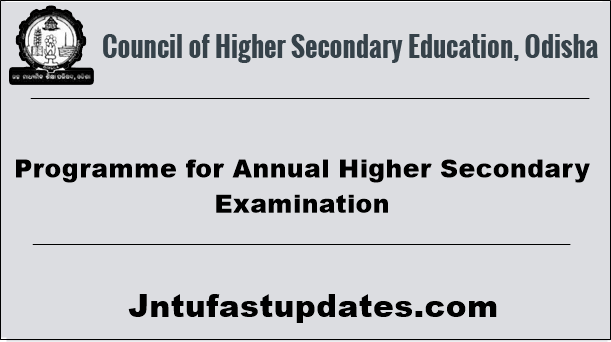 The board organizing final examinations every spring for Higher Secondary Examination (HSE), Council of Higher Secondary Education Examinations CHSE and examinations of other courses prescribed by the Class 12 Board. The Board of Secondary Education, Odisha is a Body Corporate constituted under the Odisha Secondary Education Act, 1953. It regulates, controls and develops Secondary Education in the State of Odisha. It Provides varied courses in order to qualify students for different occupations, to prepare them for University education and to equip them for various cultural purposes. Visit the official website. “http://www.chseodisha.nic.in”. On home page search for PROGRAMME FOR ANNUAL HIGHER SECONDARY EXAMINATION-2018. Click on this link, a PDF File will open in new window. Download it or take a print out for further use. 1. The examination will be held as per the programme (theory and practical) even if any of the date is subsequently declared as holiday. 2. The integrated vocational theory examinations shall be of two hours durration. 3. The timing for intergrated vocational practical subjects will be three hours duration. 5. The examinations of biology (section-a: botany & section-b: zoology) for regualr students will be held in a single sitting. 6. All ex-regular candidates i.e registration upto the year 2015 will appear in yellow colour question as per 2014-17 syllabi. however the question paper in english (regular & ex-regular) will be the same. 7. Any mistake detected should however be brought to the notice of the controller of examinations immediately. As every year students are awaited for the exams to score for the good marks as they initial career begins with the SSC examinations. They are several government jobs which is related with the secondary school examination results. last year also many of them secured best results . Many of them choose the higher studies and the remaining are interested in jobs. Get start prepared from today itself to get the best results.